Recently, a keen fundraiser and St Luke’s Lottery winner visited the specialist unit at Turnchapel to collect his £1,000 cheque and enjoy a special cream tea. Lesley Coulton, Regular Giving and Lottery Manager, and Paola Simoneschi, Communications Officer, had the pleasure of meeting retired stonemason Raymond Shipton, who shared with them treasured memories of Tricia, his beloved wife of 58 years, who was cared for at Derriford and passed away in the summer. Raymond’s niece, Susan Van Neck, was a patient at St Luke’s many years before. The couple married after Raymond completed National Service and went on to have three daughters. In later life came the joy of eight grandchildren, and the family continue to be very close. Keen baker Raymond has been President of a Plymouth Lions Club twice. The Club has generously raised money for St Luke’s, and Raymond remains a very active member. 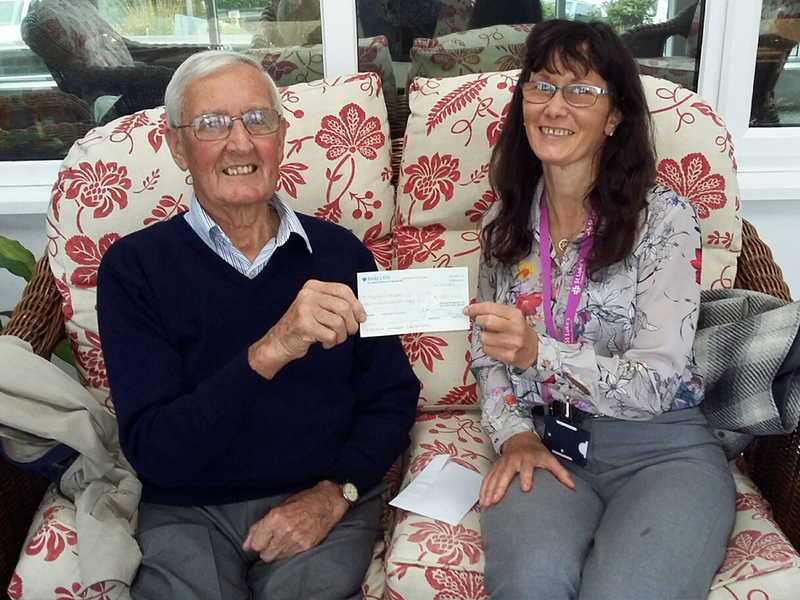 In his gratitude for receiving the Lottery cheque, Raymond presented Lesley with a cheque for £100 for St Luke’s.